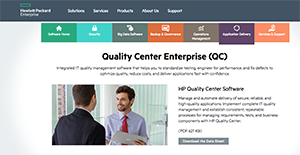 HP Quality Center is the software quality management component of the highly renowned HP application lifecycle management (ALM) software suite. This particular system provides users with tools and applications for requirements management, quality planning, software testing management, business process testing, defect management and release and cycle management. The HP Quality Center software streamlines quality management processes via automation, thus accelerating the delivery of reliable, secure, and top class applications. With HP Quality Center, businesses are able to cut down time and reduce costs required to release a software application. The platform also helps minimize the risks the defects and product errors. HP Quality Center comes with a web-based dashboard that allows developers, business analysts, and quality assurance teams to communicate and collaborate with each other. HP Quality Center simplifies and improves IT quality management of businesses. The software is designed to enable users to establish testing standards, effectively measure and achieve desired performance levels, and spot and address defects to further enhance quality, bring down costs, and provide applications quickly and with confidence. The system helps users standardize and automate processes for managing requirements, tests, and business components, thus improving the speed of work while at the same time maintain consistency. HP Quality Center lets users run multiple tests and combine them with requirements management, risk-based test management, multi-aspect test planning, and comprehensive manual and automated test execution. The software supports all types of environments. The system is an ideal option for automate unit testing. Users only have to write the test scripts one and then execute them multiple times. The time saved on testing the scripts manually is huge, enabling users to focus on getting more things done without compromising the quality. With HP Quality Center, users have a comprehensive platform that lets write the requirements, initiate the test cases, create the tests, implement them and then create the defects. Once they are all done, linking them to the test cases and then to the requirements is a breeze. All the details of the defects are compacted and displayed in one screen – summary, description, and comments. Users don’t have to scroll down and to get the defect information they need. If you are interested in HP Quality Center it could also be a good idea to analyze other subcategories of Best Test Management Software gathered in our base of SaaS software reviews. Every enterprise has its own characteristics, and might require a particular type of Test Management Software solution that will be adjusted to their company size, type of clients and employees and even particular niche they deal with. You should not count on locating a perfect app that is going to be suitable for every company regardless of their history is. It may be a good idea to read a few HP Quality Center reviews first and even then you should keep in mind what the service is supposed to do for your business and your workers. Do you need a simple and intuitive solution with only essential features? Will you actually use the complex tools needed by experts and large enterprises? Are there any specific tools that are especially practical for the industry you operate in? If you ask yourself these questions it is going to be much easier to locate a reliable service that will fit your budget. How Much Does HP Quality Center Cost? We realize that when you make a decision to buy Test Management Software it’s important not only to see how experts evaluate it in their reviews, but also to find out if the real people and companies that buy it are actually satisfied with the product. That’s why we’ve created our behavior-based Customer Satisfaction Algorithm™ that gathers customer reviews, comments and HP Quality Center reviews across a wide range of social media sites. The data is then presented in an easy to digest form showing how many people had positive and negative experience with HP Quality Center. With that information at hand you should be equipped to make an informed buying decision that you won’t regret. What are HP Quality Center pricing details? What integrations are available for HP Quality Center? If you need more information about HP Quality Center or you simply have a question let us know what you need and we’ll forward your request directly to the vendor.